Just Romantic Suspense: Is Amber Roberts a killer—or a victim? Is Amber Roberts a killer—or a victim? Congratulations to "Lynn B., the winner in Debra's giveaway. Thank you to all who participated! In the next Faces of Evil Series from USA TODAY bestselling author Debra Webb, is Amber Roberts a killer—or a victim? 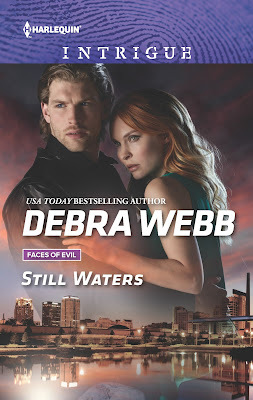 The new Faces of Evil continues with STILL WATERS! I am so thrilled to bring you another story in the Faces of Evil series. I hope you got your copy of DARK WHISPERS last month. It’s still available wherever books and ebooks are sold! STILL WATERS introduces a new investigator working for Jess Harris Burnett. Sean Douglas is back in Alabama after a career crash in Los Angeles where the client he was assigned to protect died. Sean needed to come home to heal but when he’s assigned a case with a local celebrity he isn’t so sure he can handle the pressure or the woman. Amber Roberts is either a potential victim or a murderer, Birmingham PD can’t seem to decide which. Amber is counting on Sean to help her prove she’s telling the truth and to solve this mystery. But can he keep her alive in the process? Amber is determined to be a part of the investigation and she’s digging way too deep under Sean’s skin. I’m certain we’ve all experienced the need to go home again at some point in our lives. Even if only for a day or for the rest of our lives there is no comfort place like home—whether it’s the house or town where we grew up or just the loving arms of family and friends. During my years in the military I remember most vividly the visits home to family and friends. Although we had grown a great deal from our experiences living in so many places, those experiences and the distance helped me to put down even deeper roots once I was home again. Enter to win a digital copy of DARK WHISPERS & STILL WATERS by answering this question in the comments section below: I’d love to hear about your experiences with finding your balance after an unexpected turn. For more giveaway opportunities, visit the JRS SHOWCASE! My life took a crazy turn when the company I was working for decided to close the offices in Florida (my home for 52 years) and move it to Connecticut.....Yep, I decided to make the move. It was a big adjustment as the only person I knew here was my boss...It was a hard adjustment, I missed my family and had to learn a whole a lot of new things (like driving in snow and ice and existing in the cold :-) ) but six years later and I am still here and have grown to love it. JoAnn, I live in CT, I am glad you have gotten used to things around here! Thanks for sharing, Jo Ann! In March of 2015 I fell while caring for a patient, I work in EMS. There was black ice on the sidewalk coming out of her house. I broke my ankle. At 59 it was the first time I ever broke anything. Thank goodness the company I work for and my boss are awesome. I worked from home doing my supervisor type work and when I was able started coming into the office. I am now Office Manager. I have worked for the company for 16 years and thank goodness...I miss patient care but now I work with new employees. Wow! I totally understand! I was in my fifties the first time I broke a bone! Kudos to your employer! I lived in the same town all my life and lived in the same house for over 35 years, then sold my house and moved a hundred miles away to a strange town to be near my daughter. It was a scary and anxious time but I have grown to love it here. Being near family is home, isn't it? For me, it was being around my family... they gave me unconditional support and it helped me get balance back in my life after some chaos erupted around me. Home for me has always been where my parents lived. At 38 I was divorced and didn't want to stay in the same town with my ex. My parents had moved to AZ and offered me a place to live until I could get a job and a place of my own. Over 20 years later I'm still here. I still miss my best friend who still lives there but we talk weekly and visit when we can. Mere geography can't keep good friends apart! Life has thrown me in different directions that's for sure. I tend to work through things & look forward. I have had RA for 40 years. I try to move slowly & carefully, but all it takes is one little lapse in concentration and your goose is cooked. The love and support of my hubby by my side has been my greatest blessing through the ups and downs of life.